Fort Wayne Concordia Lutheran High School 1964 College, inducted 2012 All-City & all-conference three years, twice Allen County Player of the Year, leading scorer in Fort Wayne three years, helped lead Concordia to first ever sectional championship junior year (1963)and finished high school career with 1,623 points and 22.9 career scoring average that lasted as Fort Wayne's and Allen County's scoring record for 40 years. Copied from Tom Baack in Indiana Basketball Hall of Fame. November 16, 1886 – May 9, 1954 was the Republican Mayor of Fort Wayne, Indiana, from 1934–1947 and from 1951 until his death in 1954" from Harry Baals on Wikipedia, the free encyclopedia. Some claim he pronounced his name balls while family descendants say it is bails or bales . Because of his name, Harry has been a running joke around Fort Wayne for years. There is a road named Harry Baals Drive in Johnny Appleseed Park along the St. Joseph River. He gained worldwide recognition in early February 2011. Local newspapers discussed how mayor Harry Baals was successful in getting the Nickel Plate Railroad to elevate the railroad tracks credited with encouraging growth north of the railroad tracks and rivers almost 60 years after his death. Long delays at the railroad tracks in the 1940's and 1950's was a serious factor in preventing northern growth of Fort Wayne. Growth north of the railroad tracks started in the late 1950's as housing subdivisions, schools, shopping centers continue moving north and east. He is seen in a few minutes of video from the 1950s at Access Fort Wayne public television at the Allen County Public Library. Harry Baals Drive runs south of the Memorial Coliseum from Parnell Avenue to Coliseum Boulevard through the Johnny Appleseed Camp Ground. It was discussed December 17, 2017 on You are positively from Fort Wayne, if you remember... Closed group on Facebook. Mayor Baals also brought the Indiana Air National Guard, the 122nd Fighter Wing to Baer Field Airport now Fort Wayne International Airport. A local brewing company started serving Harry Baals Irish Stout. Harry Baals gets national attention by WANE-TV NewsChannel 15 published February 10, 2011 YouTube. More details and movement to grow downtown Fort Wayne in A Story of City Building Behind the Harry Baals Joke by LynchPin Creative published July 7, 2014. Jimmy Kimmel's Plea for Harry Baals on ABC New.com and Jimmy Kimmel Live: Harry Baals, Commemorative Busts YouTubeposted December 14, 2011. A photo of a TV screen when he was a question on Who Wants To Be A Millionaire television show February 26, 2016 was discussed on 97.3 WMEE radio Facebook page, then discussed February 27, 2017 and again when a letter from Mayor H.W. Baals was posted March 7, 2017 on You are positively from Fort Wayne, if you remember... Closed group on Facebook. His photo was posted March 8, 2018 on You are positively from Fort Wayne, if you remember... Closed group on Facebook. Born January 29, 1894 in Fort Wayne, died December 9, 1930 in Shanghai, China. Baer Field Airport is named for Paul Baer. WWI ACE he was awarded the Distinguished Service Cross, the Legion of Honor, and the Croix de Guerre. Born in 1893, Paul Baer's dream was to become an aviator. As a youngster he grew up in Fort Wayne where he attended Clay, Jefferson, and Nebraska schools. Baer, eager to serve as a fighter pilot in World War I over France, Belgium and Germany, enlisted in the Franco American Flying Corps in January, 1917. Copied from the Fort Wayne Allen County Airport Authority Indiana Aviation Pioneers Wayback Machine page. The airport now known as Fort Wayne International Airport was originally named 'Baer Field' as a World War II military base. ... The City renamed the airport 'Fort Wayne Municipal Airport' in 1946. Copied from the Airport History page. Additional information is found on Who's Who - Paul Baer on FirstWorldWar.com. Paul was credited with the destruction of 9 enemy aircraft in aerial combat before being shot down behind enemy lines and taken as a Prisoner of War on May 22, 1918. After being released from his German prisoner of war camp in November 1918, he returned to the U.S. and was discharged from the Army Air Service in early 1919. He continued to work in aviation after the war, and was flying as a transport pilot when he was killed in a flying accident in Shanghai, China, on December 9, 1930. He is buried in Lindenwood Cemetery and his tombstone is shown on Find-A-Grave. Some information copied from Paul Baer Is Missing in the May 27, 1918 The News-Sentinel newspaper. His biography with photo was posted October 19, 2017 on General Douglas MacArthur Memorial on Facebook. For more see the book Hoosier Aviator Paul Baer: America's First Combat Ace by Tony Garel-Frantzen published November 27, 2017 by Arcadia Publishing. During World War II he had a security clearance but he couldn’t tell anyone what he did. ... In 1960, Baker went to work for Magnavox and was responsible for setting up a new plant in Fort Wayne. ... In 1976, Baker finally retired as vice president of manufacturing for Magnavox, and then spent 15 years working for SCORE, the Service Corps of Retired Executives, which gives free advice to budding business owners. His story Top secret no more: Sub tracker surfaces was published April 15, 2014 in The Journal Gazette newspaper. IPFW Volleyball Coach National Hall of Fame. Ball in 32 seasons as IPFW's head coach has guided the Mastodons to six Final Four appearances and five conference championships. In addition, Ball in 2011 became the second coach in the Midwestern Intercollegiate Volleyball Association's 53-year conference history to accumulate 500 career wins. One of the coach's most successful season came in 2007 when IPFW upset Ohio State to win the MIVA championship and then reached the NCAA championship match for the first time in program history. Ball that season also was named the AVCA Division I-II National Coach of the Year and the Asics/Volleyball Magazine Coach of the Year. From IPFW's Ball to be inducted into national volleyball coaches Hall of Fame by News-Sentinel staff reports published June 14, 2012. See also his son Lloy and Arnie Ball on Wikipedia, the free encyclopedia. Retires after 35 years at IPFW with a full house unveiling Arnie Ball Court before final 3-0 victory against Ball State. IPFW family pulls together for Ball, Volleydons Retiring coach honored by school, alumni by Blake Sebring published April 6, 2015 in The News-Sentinel newspaper. A fond farewell to Arnie Ball by Aubree Reichel published April 28, 2015 in The Journal Gazette newspaper. Olympic Gold Medal 2008 in Volleyball. Woodburn native Lloy Ball was a four-time Olympian and won the gold medal in his final Games in 2008. Born Lloy James Ball on Feb. 17, 1972 in Fort Wayne. Parents are Arnie and Sandy Ball. Wife Sarah, they have a son, Dyer, born in 2001, and a daughter, Mya, born in August of 2006. Lloy was recruited to play basketball at the University of Indiana for Coach Bobby Knight. Played volleyball for his father, Arnie, at IPFW, where he also got a communications degree. Began playing volleyball before the age of five. Ranked No. 9 Ball trades basketball for volleyball Youngest player on national team prospers of the TOP 50 Northeast Indiana's Top 50 Athletes of the 20th Century by The News-Sentinel newspaper. For more see USA Volleyball biography. The Volleywood Wall of Fame #3 published November 24, 2011 has photos and videos. Lloy and his father Arnie have their biographies on Lloy Ball Team Pineapple archived on the Wayback Machine. Wikipedia site. Also see newspaper articles Olympics conjure up memories Woodburn native won gold in volleyball in his final Games by Ben Smith published July 22, 2012 in The Journal Gazette newspaper and Ball enjoying Olympics from afar Gold Medal winner hoping volleyball team plays well by Blake Sebring published August 02, 2012 in The News-Sentinel newspaper. See five part The Lloy Ball Story Set it Off Part 01 by 101LakesNetwork YouTube. Ball selected for International Volleyball Hall of Fame by Blake Sebring published July 10, 2015 in The News-Sentinel newspaper. Ball Elected to International Volleyball Hall of Fame by International Volleyball Hall of Fame July 10, 2015.
posted October 4, 2017 by Fort Wayne Professional Firefighters on Facebook. Fort Wayne firefighter, died September 2017 during a training exercise. See video by Linda Jackson News on Facebook posted September 29, 2017. City firefighter dies in exercise by James Duffy published September 29, 2017 in The Journal Gazette newspaper. Fallen Fort Wayne fire captain laid to rest with videos by WANE Staff Reports published September 29, 2017, then updated October 4, 2017 WANE-TV NewsChannel 15. REMEMBERING CAPTAIN BALLIET : published October 4, 2017 on Fort Wayne's NBC on Facebook. Was a three-sport superstar in Fort Wayne and played for the NFL's Detroit Lions. Was No. 45 All Rosy from TOP 50 Northeast Indiana's Top 50 Athletes of the 20th Century by The News-Sentinel newspaper. From Roosevelt Barnes (American football) on Wikipedia, the free encyclopedia. Roosevelt Barnes, Jr. (born August 3, 1958 in Fort Wayne, Indiana) is a former American football linebacker for the Detroit Lions of the National Football League. He played college football at Purdue University. After retiring from professional football, in 1987 Barnes became a partner and contract advisor with Maximum Sports Management. Over the years, Barnes has become one of the top contract negotiators in the industry. ... Barnes attended Wayne High School in Fort Wayne. As a junior, he led his team to the SAC conference title, and the Generals also won their first sectional championship. As a senior, the team repeated, winning the school's second sectional title. ... After his success in high school, Barnes attended Purdue University on a basketball scholarship. At Purdue, Barnes demonstrated his athletic diversity by playing on the varsity basketball (4 years), football (1 year) and baseball (1 year) teams. After Purdue, Barnes continued his football career as a 10th round draft pick of the Detroit Lions. When he retired he became a prominent sports agent and returned to Fort Wayne. In 2011, he adopted a 13-year-old Caleb Biggie Swanigan, born April 18, 1997 in Indianapolis son of Tanya and Carl Swanigan, Sr.. Caleb weighted 360 pound and was living in a troubled home in Utah who came to Fort Wayne and became a local high school basketball star, then played two years at Purdue University before he entered the NBA draft in 2017. Caleb was drafted as No. 26 in the first round by the Portland Trail Blazers, Caleb Swanigan ESPN player profile. See Purdue's Caleb Swanigan has changed his body and his life by Myron Medcalf published March 18, 2017 on ESPN.com and the video From Homelessness To Basketball Star published May 3, 2017 on Steve HarveyTV.com. Born Julia Rose Buchheit on February 8, 1949. Barr's acting career began at age 13 in “Peter Pan.” She attended Central Catholic High School then transfered to South Side because they had a drama department. She graduated from Indiana University-Purdue University Fort Wayne. She is most famous for her role on the soap opera All My Children , playing the character of Brooke English. She played the role from 1976 to 1981 and from 1982 to December 20, 2006 and Barr made a special appearance as Brooke on January 5, 2010 as part of the series' 40th anniversary, and returned on February 23, 2010 for a three-month stint until April 23, 2010. Eight Daytime Emmy-winning actress. Was discussed as Fort Wayne native Julia Barr credits soap’s endurance by Keiara Carr published July 16, 2013 in The Journal Gazette newspaper. See her bio Julia Barr on Wikipedia, the free encyclopedia, on IMDb.com and 10 Fun Facts About AMC Legend Julia Barr by Christine Chagaris published May 9, 2017 on SoapCities.com. See photo on Five Fort Wayne Actresses Who Made it on the Big Screen by the The News-Sentinel newspaper. Discussed June 10, 2018 on You are positively from Fort Wayne, if you remember... Closed group on Facebook. In March 1876 James Madison Barrett moved to Fort Wayne to practice law. The son of Protestant emigrants from northern Ireland, Barrett was born in LaSalle County, Illinois, in 1852. See 4 page history of Barrett & McNagny at IndianaHistory.org. Foundry owner was Born in Salem, Ky., in 1835, John Bass was the son of Ohio valley settlers from Virginia and North Carolina who had strong sympathies for the South. In 1852, at age 17, Bass followed his older brother, Sion, to Fort Wayne ... in 1862 founded the Bass Foundry and Machine Works, locating the first plant on the southern side of the Pittsburgh, Fort Wayne and Chicago Railroad tracks (the Pennsy Line). Copied from Bass home built on industries by Michael Hawfield published August 1, 1994 in the archives of The News-Sentinel newspaper. In 1944, the site of John Bass' old mansion, Brookside, was converted into what is now the campus of St. Francis University. PBS39 has a 2010 video Brookside: The Bass Mansion Restoration discussed in the Bass Mansion - University of Saint Francis article by Conrad Schmitt Studios restoration about the period conservation and replication of the ornate decorative painting and stencil work. See vintage J.H. Bass Mansion photos posted in 2011 on the original Great Memories and History of Fort Wayne, Indiana page on Facebook. COL Sion St. Clair Bass on Find A Grave. Foundry owner and Civil War veteran was born in 1827 near Salem, Kentucky. See his house at 509 W. Washington Blvd. (Colonel Sion Bass House) on WestCentralNeighborhood.org website. He came to Fort Wayne in 1848 or 1849, and first worked as a clerk for fur traders Ewing, Chute and Company. In 1853, he formed a successful iron works firm called Jones, Bass and Company with W.H. Jones and John Hough, Jr. The foundry and machine shops were located near the new Pittsburgh, Fort Wayne, and Chicago Railroad line. Read his story along with Eliza George and Henry W. Lawton in the Three of City's Bravest Won't Be Forgotten published April 14, 2011 in The News-Sentinel newspaper. His home is now the Sion Bass House Spa Bed & Breakfast a part of the Lasalle Bed and Breakfast Rooms and Suites. Born in 1879 Russia, social worker, first secretary of the Jewish Federation, died in 1956 and is buried in Lindenwood Cemetery. Read her story in In Celebration of Women's History Month: Fort Wayne Women remembered at Lindenwood Cemetery by Nancy McCammon-Hansen published March 12, 2014 in History Center Notes & Queries blog. Born September 13, 1930 to Leslie and Bernice (Danner) Baumgartner in Fort Wayne. Mary graduated from Central High School. She died Saturday June 2, 2018 at Lutheran Life Villages in Kendallville. She was preceded in death by four sisters, Betty Simon, Marjorie Markley, Mildred Baumgartner, and Delores Baumgarter. Miss Baumgartner was a teacher at Jimtown High School in Elkhart and Leo High School in Leo and retired in 1985, after 28 years. She attended the Rome City United Methodist Church. See her June 3, 2018 obituary at the Young Family Funeral Home. She grew up as a fan of the Zollner Pistons fastpitch softball team, Baumgartner played in the All-American Girls Professional Baseball League with the Peoria Red Wings, Kalamazoo Lassies and mostly with the South Bend Blue Sox where she played for five seasons. The highlights of her career were being named to the 1953 all-star team and helping the Blue Sox win league titles in 1951 and 1952. A catcher, Baumgartner was known for her excellent glove, committing only 59 errors in 1,228 fielding chances during her career. She struggled as a hitter with a .177 batting average. She served as president of the AAGPBL Players Association from 1993 to 1998 and appeared briefly in the movie A League of Their Own. Copied from Women’s sports trailblazer Mary “Wimp” Baumgartner has passed by Blake Sebring published June 3, 2018 in The News-Sentinel newspaper. See her June 2, 2018 death notice on All American Girls Professional Baseball League Players Association on Facebook, Mary Baumgartner page at AAGPBL and Mary Baumgartner on Wikipedia, the free encyclopedia. Was born in Butler County, Ohio on December 5, 1814. Lawyer, Postmaster and Mason and former mayor of Troy, Ohio. Moved to Fort Wayne where he was a lawyer and postmaster. See his long May 31, 1875 Fort Wayne Daily Times newspaper obituary on the Bayless Message Board. His 1876 home is on David Rumsey Map Collection. He was Grand Master to the Grand Lodge of Indiana at Indianapolis, May 23, 1859title of a Google ebook. The "Masonic Lodge #359 was formed in 1866 in the city of Fort Wayne. It is named in honor of a man who had achieved great things within our noble fraternity. He served multiple terms in the highest offices of several Masonic bodies. He died in his home in 1875 and is buried here in the city. ... One of our most famous brothers is the late Dave Thomas, of Wendy’s Hamburger fame. He was initiated as a Freemason in the Temple and was a member of our lodge until he passed away in 2002." from the Sol D. Bayless Lodge # 359 About Page. Born May 24, 1982 in Fort Wayne, South Side High School graduate, is a 3rd time member of the 2010 U.S. National Soccer Team. He began his professional career with the Chicago Fire while still in high school and is one of the most decorated players in American soccer history and one of only three U.S. men to play in four FIFA World Cups. See DaMarcus Beasley on Wikipedia, the free encyclopedia, MLS Player profile, U.S. Soccer page, and Twitter page. World Cup soccer player in 2014 had a 15-year career in the national team program and playing for top clubs in Europe, Mexico and the United States. Where do Beasley's 4 World Cup appearances rank in Fort Wayne sports history? by Blake Sebring published June 14, 2014 in The News-Sentinel newspaper. Fort Wayne native and US soccer player DaMarcus Beasley photo gallery at The News-Sentinel newspaper. July 18, 2014 Mayor Tom Henry proclaimed today “DaMarcus Beasley Day” in the City of Fort Wayne . Damarcus Beasley retires from US national team published December 15, 2014 in The Journal Gazette newspaper. Beasley made city a soccer town Former South Side standout retiring from US team in a Ben Smith Special December 16, 2014 in The Journal Gazette newspaper. Discussed July 19, 2015 on Indiana News 1 formerly You know you've lived in Fort Wayne too long when... Facebook group. A statue of Fort Wayne native DaMarcus Beasley was unveiled along with those of 15 other sports legends at The Children's Museum of Indianapolis on Friday. Bronze statue of DaMarcus Beasley unveiled in Indianapolis published July 27, 2018 by WANE-TV NewsChannel 15. Born October 7, 1815, died April 21, 1900, served as pastor of the Second Presbyterian Church in Fort Wayne, Indiana from 1844 until 1850. He was a brother of Harriet Beecher Stowe, the famous author of Uncle Tom's Cabin and remembered with the Harriet Beecher Stowe Center. Read A Charles Beecher Christmas by Peggy Seigel posted December 10, 2010 on the History Center Notes & Queries blog. He is buried in Harmony Cemetery, Georgetown, Massachusetts shown on Find-A-Grave. See A Passionate Missionary to the West Charles Beecher in Fort Wayne, Indiana, 1844-1850 by Peggy Seigel published in the December 2010 Volume 106, Issue 4 of Indiana Magazine of History. Inducted 2010 Indiana Basketball Hall of Fame. Heritage High School won state championship in 1982 and semi-finalist in 1983, selected Miss Basketball in 1983 and Mental Attitude Award winner...played for Central Michigan University, holds single season scoring record with 20.8 ppg, 3rd all-time scoring leader, holds career record in free throws made and free throw percentage, at one time made 57 consecutive free throws, First Team Academic All-American 1987, received a NCAA Post-Graduate Scholarship...inducted into Central Michigan University Hall of Fame in 1997...2008 Silver Anniversary Team. Arnie Ball said the Hoagland native was "The best volleyball player ever from Indiana." In 1970 he was named a first-team U.S. Volleyball Association All-American. Beerman played baseball and basketball at Indiana Tech before transferring to Ball State in 1960. He was named the Midwest Intercollegiate Volleyball Association's Most Valuable Player in 1963. He later played with the U.S. National Team in 1966, 1969 and 1970. He was also part of an AAU national championship team in 1974, and was a member of a national runner-up Golden-Masters team in 1988. He went on to coach volleyball at Wayne, Bishop Luers, and Snider High Schools. Copied from No. 38 Totally Terrific of the TOP 50 Northeast Indiana's Top 50 Athletes of the 20th Century by The News-Sentinel newspaper. Died Thanksgiving Day November 28, 2013, at the age of 92, born in Bluffton, graduated from South Side High School in 1938. He moved to California in the 1950s, where he wrote for some of the nation’s most recognizable publications. Copied from Magazine writer, South Side grad dies by Rebecca S. Green published December 3, 2013 in The Journal Gazette newspaper. Brother of Johnny Bench, a catcher for the famous Cincinnati Reds baseball Big Red Machine in the 1970s, owned William Bench's Fort Wayne AMC-Jeep dealership from November 1, 1978 until around 1981. See an October 28, 2013 discussion on the original Great Memories and History of Fort Wayne, Indiana page on Facebookand September 7, 2017 discussion on You are positively from Fort Wayne, if you remember... Closed group on Facebook. 97, born December 7, 1915 in Rockford, Indiana, died May 15, 2013. The basketball Pistons, now the Detroit Pistons, won National Basketball League championships in 1944, 1945 and 1946. The fastball team won world titles in 1945, 1946 and 1947. .... In 2007 the Basketball Hall of Fame acknowledged Fort Wayne the birthplace of the NBA in an 2007 exhibit with Bennett in attendance. That same year he received a Red Coat from the Mad Anthonys. ... Bennett is listed as the Pistons' first coach in a pro league as Fort Wayne started the 1948-49 season in the BBA. ... The National Basketball Association was born in Bennett's living room in 1948. He helped start the Ladies Professional Golf Association Championship tournament in 1955. He was there when the Mad Anthonys golf tournament began in 1957. Copied from his story Carl Bennett built part of Fort Wayne history May 17, 2013 by Blake Sebring of The News-Sentinel newspaper. See also Carl Bennett, city sports icon, dies Helped develop Zollner Pistons, Mad Anthonys May 17, 2013 and By keeping past alive, Bennett will never die May 17, 2013 by Ben Smith of The Journal Gazette newspaper. See his D.O. McComb and Sons obituary. Born in France in 1808, entered the seminary at age 17, came to Fort Wayne in 1840 and is best known for building the Cathedral of the Immaculate Conception. Fr. Benoit contributed in other ways to the history of Catholicism in Fort Wayne. ... Fr. Benoit died in January 1885, after serving Fort Wayne for 44 years, and was buried in the Cathedral in the diocese that he had helped to found and grow. Read his story Julian Benoit by Carmen Doyle pulished May 1, 2013 in the History Center Notes & Queries blog. Berghoff left his native Dortmund, Germany, at age 17 and landed penniless in Brooklyn in 1870. Barely 12 years later, he founded his namesake brewery in Fort Wayne, IN. Berghoff’s Dortmunder-style beer was so well received that he was inspired to open a café in Chicago to showcase it – selling at a nickel a glass and a dime for a stein with sandwiches offered for free. The bar remained open even through Prohibition by selling near-beer and Bergo soda pop and became a full-service restaurant that still carries the Berghoff name. When Prohibition was repealed in 1933, the City of Chicago issued liquor license No. 1 to The Berghoff and has done so each year ever since. Copied from About The Berghoff web site. Photo in August 24, 1913 Fort Wayne Gazette page 4. Photo shows George M., 71, Rev. 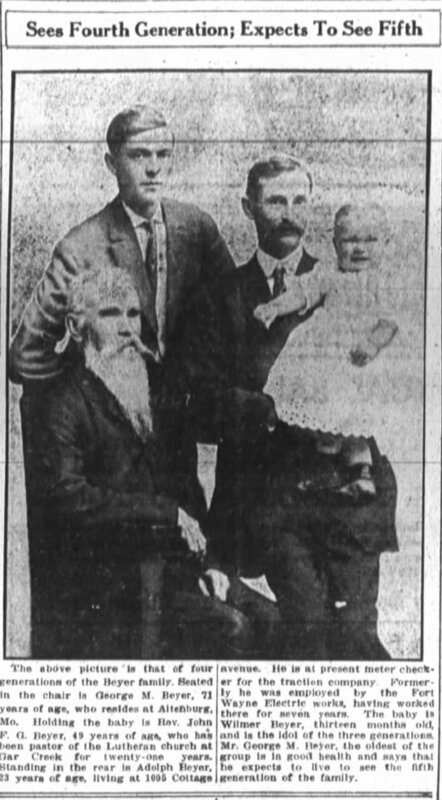 John F. G., 49, Adolph, 23, and baby William Beyer, thirteen months. George expected to live to see the fifth generation! March 20, 1802 – September 9, 1845, 7th Indiana Governor. Samuel Bigger was a Whig governor of the U.S. state of Indiana from December 9, 1840 to December 6, 1843. He was born in Franklin, Ohio, the son of John Bigger, the Ohio House of Representatives Speaker of the House. Samuel Bigger was a student at Ohio University in Athens, Ohio in the 1820s where he received both A.B. and A.M. degrees. Samuel Bigger later moved to Liberty, Indiana in 1829. His governorship was beset from the state’s debts, resulting from the failure of the Internal Improvements Program. He died in 1845 in Fort Wayne, Indiana, aged 43, and was buried in Broadway Cemetery now McCulloch Park. From Wikimapia See also Wikipedia article: http://en.wikipedia.org/wiki/Samuel_Bigger See also: Fort Wayne Times & Press excerpts, Gov. Samuel Bigger death, canal news, 1846 by Adam Barrone and Michael Hudson in Genealogy Gems: News from the Fort Wayne Library, No. 149, July 31, 2016. First Female Fort Wayne Fire Chief. Chief Biggs joined the Fort Wayne Fire Department as a firefighter in 1995. In 1999, she was promoted to Captain of the Fire Prevention Bureau and became Captain of the Operations Division in 2001, where she served for seven years, until being appointed to the position of Assistant Chief. Chief Biggs has had specialty training as a certified diver as a member of the water rescue team and as a technician for the hazardous materials team... A 17-year veteran of the Fire Department, Biggs currently serves as Assistant Chief, a position she was promoted to in 2008. Copied from Mayor Henry Names Fire Department Veteran to Highest Post Fire Chief Amy Biggs Ready for New Tasks June 13, 2012 from City of Fort Wayne. She resigned June 1, 2014 and was replaced when Mayor Henry along with City Clerk Sandy Kennedy and Public Safety Director Rusty York swore in Eric Lahey the 22nd Fort Wayne Fire Department Chief on June 2, 2014. Born August 4, 1988, killed August 13, 2011 when a severe thunderstorm blew through the Indiana State Fair grounds in Indianapolis. The Indiana State Fair stage collapsed one month after she was hired to teach seventh-graders at a Muncie school when classes resumed that fall. Scholarship fundraiser keeps memories alive by Chris Meyers published August 1, 2014 in the The Journal Gazette newspaper. See photos, newspaper story and obituary on Find A Grave memorial. Herman Bir and Oliva Stein met in Fort Wayne around 1916. Herman, recently widowed, heard Olivia singing in the choir loft at Precious Blood Catholic Church. They were married during the Spanish flu epidemic of 1918, when public gatherings were not allowed due to spreading the sickness. Joseph Collins put together this video documentary with his cousin, Joe Bir, about that time in history and posted it February 24, 2019 on You are positively from Fort Wayne, if you remember... Closed group on Facebook. Bir Stein Documentary - Fort Wayne by Joe and Robin Collins published August 11, 2016 on YouTube. Born March 19, 1813 in Wyoming County, Pennsylvania. He moved to Logansport, Indiana in 1834, married four years later to Anne Suttenfield. Two children, James Ochmig, 1841-1906, and Eliza Jane, 1851-1911. He made his way to Fort Wayne and was involved in developing the Wabash and Erie Canal. In 1842 he was elected surveyor for Fort Wayne. He served as a city councilman 1851-1852, and Allen County treasurer 1856-1860. He also served in the Indiana House of Representatives from 1849-1851, 1863 and 1865. In 1871, he won a seat in the state senate, reelected in 1873 until 1875. Bird died January 21, 1878 and was buried in Lindenwood Cemetery. His wife Anne died in October 1879 at age 58. For more see Megan's Mystery Monday - Falling in Love with Ochmig by Emily Royer published November 30, 2015 in History Center Notes & Queries blog and Ochmig Bird (1813-1878) by Andy Osterdahl published December 11, 2011 in The Strangest Names In American Politcal History. 107, daughter of the late Estella E. Shinabarger VanCuren and Leroy E. VanCuren, died October 11, 2014. Two sons, David William (Diana Wiley) Blackledge and Robert Donald (Sally McCollum) Blackledge. Graduated with a teaching degree during the Great Depression when Indiana passed a law saying that married women couldn't be teachers. With her husband and young child moved to the Philippines. Her husband was in a prisoner of war camp during World War II and died in 1945. She and her children came back to Fort Wayne where she taught school for 28 years, eventually becoming a principal at Price and Southern Heights elementary schools. Read her story Law, war no bar to longtime educator by Frank Gray published October 16, 2014 in The Journal Gazette newspaper. And her October 14, 2014 Fort Wayne Newspapers Legacy.com obituary. June 22, 1922 to June 12, 2002. Graduated from South Side High School in 1939. A famous fashion designer, he received the Coty award five times - in 1961, 1963, 1968, 1970 and 1971. Born William Ralph Blass [June 22] in 1922, was the only son of Ralph Aldrich Blass, a traveling hardware salesman who committed suicide when his son was five years old, and his wife, the former Ethyl Easter Keyser (died 1952), a dressmaker. He had one sister, Virginia Mae (born 1920). In his autobiography Blass wrote that the margins in his school books were filled with sketches of Hollywood-inspired fashions instead of notes. At fifteen, he began sewing, selling evening gowns for $25 each to a New York manufacturer. At 17 he had saved up enough money to move to Manhattan and study fashion. He excelled in his fashion studies immediately and at 18 was the first male to win Mademoiselle's Design for Living award. He spent his salary of $30 a week on clothing, shoes, and elegant meals. In 1942 Blass enlisted in the army. He was assigned to the 603rd Camouflage Battalion with a group of writers, artists, sound engineers, theater technicians, and other creative professionals. Their mission was to fool the German Army into believing the Allies were positioned in fake locations. They did this by using recordings, dummy tanks, and other false materials. Copied from Bill Blass (designer) on Wikipedia. In the early '70s, fashion designer Bill Blass returned to his hometown for the first time in 25 years. On September 29, 1971, Bill Blass returned to Fort Wayne ahead of a local fashion show that included his latest looks. See newspaper article. Dress, 2-Piece on the Smithsonian National Museum of American History blog. He counted among his clients Nancy Reagan and Mrs. Henry Kissinger from Legendary Locals of Fort Wayne, by Randolph L. Harter, Craig S. Leonard discussion August 14, 2015 on Indiana News 1 formerly You know you've lived in Fort Wayne too long when... Facebook group. Bill Blass Biography Business Leader, Fashion Designer (1922–2002) on biography.com. Inside Fashion: Bill Blass, 1983 YouTube video posted April 8, 2017 on Design Week Fort Wayne on Facebook. Bill Blass: The Forgotten Story of an All-American Classic How a Fort Wayne Native Branded the Iconic American Image and Why Modern Consumers Don’t Know His Name by Niclas Hulting published April 20, 2017 on design week fort wayne and posted April 24, 2017 on Design Week Fort Wayne on Facebook. Discussed September 16, 2018 on You are positively from Fort Wayne, if you remember... Closed group on Facebook. Fort Wayne Fashion Icon Bill Blass by K Thompson posted December 19, 2018 on Articulate from the Fort Wayne Museum of Art. Bill Blass returns to city for fashion show in 1971 on Sept. 29, 1971, Blass returned to Fort Wayne ahead of a local fashion show that included his latest looks by Corey McMaken published February 28, 2019 in The Journal Gazette newspaper. 94, husband William died in 2002. Daughter, Pamela (Mike) Malicoat of Marinette, Wisc. ; son, Willson Bloch of Mancos, Colo.; six grandchildren; and five great-grandchildren. Preceded in death by her infant son, Andy in 1952; and three younger sisters, Mary Ann Schwartz, Janet Martin, and Katherine Mayland. See her obituary. She was an early environmentalist in the 1950s was an early founding member of ACRES. An enduring environmental influence published March 5, 2014 in The Journal Gazette newspaper. The 1999 Homestead High School graduate, 31, is building a career in Los Angeles as a composer for films and TV series. Read his story Fort Wayne native Nathaniel Blume making a mark as film and TV series music composer He wrote the music for a documentary showing Thursday night at Cinema Center by Kevin Kilbane published December 26, 2012 in The News-Sentinel newspaper. LPGA Tour golfer, LPGA pro sees better days ahead Struggling Blumenherst shares tips at McMillen Park clinic by Sean Morrison published July 6, 2013 in The Journal Gazette newspaper. She left the LPGA Tour in 2013 about six months after marrying Oakland A's first baseman Nate Freiman in December 2012. Expecting first child according to Retired series: Blumenherst is making relationship work The left LPGA Tour to be with Major League husband by Blake Sebring published July 14, 2014 in The News-Sentinel newspaper. Died in 2014, a community leader and longtime owner and operator of the Fort Wayne location of Bobick’s Golf. He passed away April 9, 2018, he was the son of Donald and Velma (Klausing) Bobilya. He was survived by his wife of 29 years, Annie; their four children: Carrie (Kevin) Collins; Daniel (Rachel) Bobilya; Mark Bobilya; Lesley Ann (Marc) Pfleging: daughters-in-law, Tina Bobilya and Leigh Bobilya; grandchildren Alix, Hannah, Jagger, Donovan, Mallory, Davis, Joseph, Elizabeth, Ella, Lilly, and Addison; Also surviving are brothers Dean (Lori) Bobilya; Dennis Bobilya; sister Sandra (Tom) Sorgani; brother-in-law Michael (Karen) Johnson; and eight nieces and nephews. He was proceeded in death by his parents. For more see his April 12, 2018 D.O. McComb and Sons obituary. He attended IPFW in 1975 studying accounting and passed the CPA exam in 1975. Bobilya worked at Maloley's Fine Foods as a carry-out boy while in high school and later served as controller of Maloley's from 1976 to 1981. He began his employment with Pizza Hut of Fort Wayne in 1981 as controller when the company had 13 Pizza Huts. As president and CEO of the company, Bobilya was overseeing 47 Pizza Huts and four KFC restaurants. Bobilya was on the board of directors for Parkview Hospital and national board of the Pizza Hut Restaurant Supply Chain Solutions Co-op. He also served as chairman of the board for Turnstone Center for Disabled Children and Adults and the Foellinger Foundation. Other affiliations include the Convention and Visitors Bureau board of directors, including as president from 1994 to 1996, and Fort Wayne Country Club board of directors and president from 2010 to 2011. Copied from President of Pizza Hut of Fort Wayne dies at 65 by Mathew LeBlanc and Lisa Green published April 9, 2018 in The Journal Gazette newspaper. North Side class of 1942. Several Fort Wayne athletes were champions in the All-American Football Conference (1946-1949) with the Cleveland Browns discussed April 26, 2018 with his biography posted by The History Center on Facebook. Daughter of Jesse Vermilyea, born in 1844 in the family mansion in Aboite township. Helped develop the Hope Hospital, Visiting Nurses League and the Allen County Children’s Home. She died in 1914. Read more in In Celebration of Women's History Month: Fort Wayne Women remembered at Lindenwood Cemetery by Nancy McCammon-Hansen published March 12, 2014 in History Center Notes & Queries blog. Mrs. Celestine Bonjour, aged 84, a lifelong resident of Jackson Township, succumbed to senility and complications this morning about 6:30 o'clock at the home of a son, Eugene Bonjour, in Jackson Township. The son lives on the old Bonjour homestead where Mrs. Bonjour had resided for many years. Surviving besides the son are a daughter, Mrs. Ernestine Coonrod, 23 grandchildren and two great-grandchildren, and many nieces and nephews. The body was removed to the Harper Funeral Parlors at New Haven and will be returned to the home of the son Tuesday morning. Funeral services will be held Wednesday morning at 8:30 o'clock at the St. Louis Catholic Church at Besancon. The Rev. L. Nicholas Allgeir will officiate. Burial in the church cemetery. July 21, 1930 obituary in The News-Sentinel newspaper. The Rev. A. Hunter Colpitts will officiate at funeral services for Danny Wayne Bonjour, four-month-old son of Mr. and Mrs. Virgil Bonjour, 1151 South Lafayette Street, at 11:15 a.m. Wednesday. The services will be held at the D. O. McComb & Sons Funeral Home. The child died at 1:28 a.m. Monday at the Methodist Hospital. Survivors include the parents; a brother, Roland, at home, and three grandparents, Mr. and Mrs. Earl Hart, Fort Wayne, and Mrs. Nellie Bonjour, Montpelier. Friends may call at the funeral home after noon today. Burial will be in Scipio Cemetery. Tuesday, March 15, 1949 article in The Journal Gazette newspaper. INSTANTLY KILLED. FREDERICK BONJOUR MEETS DEATH BY ACCIDENT SATURDAY. Loaded Shot Gun in the Hands of His Brother, Eugene, Severs the Jugular Vein-His Parents in This City at the Time. Frederick Bonjour, the son of Mr. and Mrs. Louis Bonjour, of near Zulu, was shot and instantly killed at his home Saturday morning, about 6:30 by the accidental discharge of a shot gun in the hands of his brother, Eugene. His death was instantaneous, as he uttered no sound after the terrible accident, the only sign of life manifested afterward being the opening and shutting of his eyes as he lay weltering in his own blood. Mr. and Mrs. Bonjour had risen early in the morning and came to this city to market. About 6 o'clock the sons arose, the sisters being still in bed. Upon the porch stood two guns, both of which were supposed to be empty, as they had not been used in a long time, and no one knows when or by whom one of them was loaded. One of the boys made the proposition that the guns be carried up stairs, and in compliance with this, Eugene went to the porch, picked up the two guns, and putting both under one arm, with the muzzles pointing in front oh him, started to carry them up stairs. As he passed through the door into the kitchen, In some manner the hammer of one of them struck against the door jamb, or caught upon something, and was discharged. It so happened that the brother Frederick, was in range of the weapon, and the entire charge of buck shot entered his neck, shattering it and severing the jugular vein, and then lodged in the wall. The injured man fell to the floor without a groan, and was dead before the terrified members of his family could realize what had happened. The parents were informed by telegraph of what had happened, and hastened home. The family is one of the most highly respected of Allen county, and the entire neighborhood greatly deplores the tragedy by which the young man was brought to an untimely end. Coroner Barnett was notified of the accident and went at once to the scene. The brother in whose hand the gun was discharged was almost crazed with sorrow, but no possible blame can attach to him, as the discharge was manifestly accidental. Tuesday, November 4, 1901 article in The Journal Gazette newspaper. Virgil R. Bonjour, 74, died at 1:45 p.m. Tuesday at Lawton Nursing Home. A lifelong Allen County resident, he formerly owned the Bonjour Garbage Service. Surviving are three sons, Rolland L. and Earl E., both of Fort Wayne, and Virgil R. jr., of Cincinatti; three daughters, Barbara Wyme, of Harrison Ohio, Diana Wymer, of Fayetteville, N.C., and Karen Creager, of Windham, Ohio; four brothers, Maurice and Louis, both of Fort Wayne, Howard, of Montpelier, and James, of Tucson, Ariz.; four sisters, Opal Tenny and Doris Evans, both of Avilla, and Viola Drabenspott, of Warsaw; and 14 grandchildren. Services pending for Friday at Tom Mungovan Funeral Home, 2221 S.Calhoun St.; calling 6 to 8 p.m. today. Thursday, November 19, 1987 article in The Journal Gazette newspaper. Artist and advertising executive, born in Vincennes, Indiana, in March 1892. In 1923 came to Fort Wayne, in 1926 organized the Fort Wayne Advertising Club, eventually formed Bonsib Advertising. See Louis William Bonsib by Tom Castaldi posted February 9, 2016 on History Center Notes & Queries blog. See his painting "Jail Flats" posted January 27, 2017 and discussion on You are positively from Fort Wayne, if you remember... Closed group on Facebook. Joseph was the son of Daniel Boone’s younger brother Edward “Ned” Boone. He enlisted in early October 1790 as a private in the Kentucky Militia, nicknamed the “Limestone Volunteers”. On October 22, 1790 Private Joseph Boone’s detachment was ordered to swing around the junction of the St. Joseph and St. Mary’s rivers, where Harmar Street now ends at the river, and attack the Maumee Indian village at present-day Fort Wayne, Indiana. During the battle, which would become known as “Harmar’s Defeat”, Indians overran the inexperienced Americans. Most of the militiamen fled without firing a shot. Read his story in Saving Private Boone Joseph Boone at “Harmar’s Defeat” by Jeffery L. Johnson, 5th great grandson of Joseph & Rebecca Fry Boone, (Copied from Compass, October 2004) published by The Boone Society. Discussed May 9, 2017 on You are positively from Fort Wayne, if you remember... Closed group on Facebook. Born in Fort Wayne, Indiana on August 31, 1912, he graduated from South Side High School. He revolutionized enforcement of drunken driving laws by inventing the Breathalyzer to measure alcohol in the blood, died Saturday August 10, 2002, he was. An Indiana University Professor Robert F. Borkenstein began his career with the Indiana State Police in 1936. He invented the Breathalyzer® in 1954 and retired in 1958 as captain in charge of Laboratory Services. His academic career began in 1958 when he received an A.B. degree from Indiana University. Also in 1958, he became a professor at Indiana University's Department of Forensic Studies. Indiana University Archives maintains the "Robert F. Borkenstein papers, 1928-2002, bulk 1940-2002." The National Safety Council issues an annual Robert F. Borkenstien award also recognized by I.A.C.T. the International Association for Chemical Testing. A 2002 Indiana University display was called the "Borkenstein and His Monster: The Man Behind the Breathalyzer” — A New Exhibit at the IU Archives." He is buried in Lindenwood Cemetery with tombstone shown on Find-A-Grave. Breath of Fresh Air by Tom Castaldi, local historian,published June 14, 2016 on History Center Notes & Queries blog. From Drunkometer to Breathalyzer: How Indiana Scientists Crusaded Against Drunk Driving by Tom Castaldi, local historian,published August 3, 2016 on Indiana Historical Bureau blog. A Man Who Made a Difference with video interview of his niece by Eric Olson, 21Country Featured Reporter. Co-founder with his brother Tom of the Asher Agency, founded in 1974 with one client. He helped grow the agency to its current size in 2017 of 65 employees and over $55 million in annual sales, with offices in Fort Wayne and Indianapolis, IN; Atlanta, GA; Cary, NC; Oklahoma City, OK; Dallas, TX; Lexington, KY; Charleston, WV and Washington, D.C. Recipient of the Sagamore of the Wabash, presented by Governor Evan Bayh and the Silver Medal Award, Presented by American Advertising Federation of Fort Wayne. Copied from We Remember Tim published October 28, 2017 at AsherAgency.com. Local business community loses a leader with passing of Tim Borne by Jonathon Shelley, News Director published October 27, 2017 on WPTA21 ABC TV station. Born on August 8, 1854, in Allen County on a farm eight miles north of Fort Wayne, Bowser received just over three months of formal schooling. In 1885, Bowser conceived of pump that aided in the moving of water from a well without the aid of a rope and bucket. Since most grocers sold kerosene, he believed that there would be a ready market for his new pump. The first pump was installed on September 5, 1885 in the store of Fort Wayne grocer Joseph Gumper. Following the expanded demand for his pumps, Bowser founded S.F. Bowser and Company in July of 1888, on Creighton Avenue. After two fires, in 1894 and 1897, the S.F. Bowser Company, Inc. became one of the largest gas pump manufacturers in the world. Known for being paternalistic towards his employees, Bowser provided all workers with sick, accident and death benefits. In 1917, the Bowser Company began construction on a new office building, this building stood on Creighton Avenue until the spring of 2018. The S.F. Bowser and Company, Inc. closed its Fort Wayne facility in 1961. S.F. Bowser, once one of the wealthiest men in Allen County, died from complications of diabetes on October 3, 1938. Copied from photos and history posted August 8, 2018 on his 164th birthday by The History Center on Facebook. His name became synonymous with the term gas pump. ... As a result, in New Zealand and Australia, fuel dispensers are still referred to as 'Bowsers.' From Fort Files - On this day in history published September 5, 2014 on Greater Fort Wayne Business Weekly. Bowser is the title of an August 4, 2007 post on World Wide Words Investigating the English language across the globe said the word bowser was used in a report stating: BBC News reported that drinking water was to be brought into the stricken area using bowsers . Further along in the article it stated We owe its existence to the late Mr Sylvanus Bowser, of Fort Wayne, Indiana. A photo of 1911 Auburn with his pump discussed March 3, 2014 on the original Great Memories and History of Fort Wayne, Indiana page on Facebook. In 1885, the automobile wasn't invented yet when gasoline was a byproduct of refining kerosene for stoves and lamps. from Sept. 5, 1885: Pay at the Pump by Randy Alfred published September 5, 2008 on Wired.com. Sylvanus F. Bowser by OSP published September 18, 2006 on Fort Wayne Reader. Bowser, Man and Building published May 18, 2017 on Indiana Landmarks. CEO of Zollner Corporation, Bowstrom took over the iconic Fort Wayne company in 1982 when she was elected chairwoman of the board and chief executive officer, succeeding Fred Zollner. She became assistant to the chairman of the board in 1967, when Zollner was elected chairman of the board, and then was elected herself to the board of directors in 1978. 'She was very capable and handled it very well,' Combs said. But she started out as Zollner’s executive secretary, having applied for the job in the 1950s in a desire to move back to her home state. From Zollner CEO Bowstrom dies at age 93 Took control in 1982, started as secretary in ’50s by Rebecca S. Green published April 10, 2012 in The Journal Gazette newspaper. Fort Wayne South Side High School 1959, Indiana University 1963, inducted 1992 into Indiana Basketball Hall of Fame. Terra Brantley at the History Center by WANE 15 News published on February 5, 2019 on YouTube. Terra Brantley began her career in 1986, at WPDE-TV in South Carolina, then in 1993, moved to Fort Wayne to work at WKJG-TV, before joining the team at WANE-TV. Prior to anchoring evenings, Brantley led WANE 15's number one morning and noon newscasts for more than 20 years. She has served regional viewers for more than 26 years, and is the longest serving African-American news anchor in the state. Copied from a February 4, 2019 Facebook post with photos by The History Center on their newest display. 1810-1857, Gallatin County, Kentucky native, ordained as a Methodist minister at the age of twenty, and began his career as a circuit rider in southern Indiana. Reverend Brenton came to Fort Wayne after accepting an appointment of pastor of the Berry Street Church and the following year was named presiding elder of the Fort Wayne district. Samuel Brenton declared his candidacy for Congress as representative from the Tenth Congressional District in 1851. He died in Fort Wayne on March 29, 1857, at the age of forty six, and is buried in Lindenwood Cemetery. Read more of his story Congressman Samuel Brenton of Fort Wayne by Tom Castaldi posted January 8, 2015 on the History Center Notes & Queries blog. Died March 28, 2017, an Allen County Superior Judge retired in 1998, he was Allen County's first black judge. Ex-judge devoted to family court dies, 80 by Dave Gong published April 4, 2017 in The Journal Gazette newspaper. The Brutal Tackle That Changed the Face of Football - The Johnny Bright Story published by WANE 15 News on Feb 28, 2019 on YouTube. See the full, in-depth story here: The Brutal Tackle That Changed the Face of Football - The Johnny Bright Story Johnny Bright endured a series of brutal, racist tackles during his college football years in the 1950's, and in turn would end up securing protection for generations of future athletes. Born in Fort Wayne June 11, 1930, he died December 14, 1983 in Edmonton, Alberta, Canada. Johnny was a three-sport football, basketball, track and field star at Central High School. He graduated in 1947, accepted a track and field scholarship from Drake University in Des Moines, Iowa allowing him to play football. His senior year he was the pre-season favorite for the Heisman Trophy, but was the victim of the mostly forgotten Johnny Bright Incident. Johnny Bright, Central High School, Fort Wayne, Indiana page of information within the Central High School collection at The Genealogy Center. Central High Class of 1948. Several Fort Wayne athletes were champions in the All-American Football Conference (1946-1949) with the Cleveland Browns discussed April 26, 2018 with his biography was posted by The History Center on Facebook. Johnny Bright Member Biography at National Football Foundation. Johnny Bright at Wikipedia, the free encyclopedia states he was a professional Canadian football player, member of the Canadian Football Hall of Fame, the National Football Foundation's College Football Hall of Fame, the Missouri Valley Conference Hall of Fame, the Edmonton Eskimos Wall of Honour, the Alberta Sports Hall of Fame, and the Des Moines Register's Iowa Sports Hall of Fame. Drake Heritage Collection has numerous photos, articles, and audio. JOHNNY BRIGHT - AMERICA'S LOSS by coach Hugh Wyatt. Author to Sign Book on Drake Legend Johnny Bright Before Home Football Game by Mike Chapman published September 29, 2010. Go, Johnny, Go by Blake Sebring has Bright as No. 2 of the local TOP 50 Northeast Indiana's Top 50 Athletes of the 20th Century by The News-Sentinel newspaper. Find-A-Grave has his burial information in Edmonton, Alberta, Canada. The Edmonton Journal first presented the John Bright Memorial Award in 1984 to recognize exceptional high school students who excelled in three integral areas of John Bright's life: academics, athletics, and citizenship. Discussed September 23, 2017 on the original Great Memories and History of Fort Wayne, Indiana page on Facebook. The brutal tackle that changed the face of football by Kaitor Kay posted: February 28, 2019 on WANE-TV NewsChannel 15. See video above. March 5, 2019 FWCS, Fort Wayne Community Schools on Facebook posted the WANE-TV NewsChannel 15 video shown above and Steve Wolfe posted 3 drawings his father Robert C Wolfe drew as a teenager many years ago. A 2005 graduate of Homestead High School, creates wardrobe pieces for Miley Cyrus, Beyonce', Carmen Electra and his designs were in Vogue magazine and others. In 2014, he lived in New York’s East Village, on East 14th Street in a ridiculously expensive two-bedroom apartments and studio From Homestead to Vogue Went to NYC with $800; now, stars wear his clothes by Steve Warden published December 30, 2014 in The Journal Gazette newspaper. Widow of John Brown one of the pioneer blacksmiths of Fort Wayne. April 1, 1908 Fort Wayne Journal Gazette newspaper obituary posted April 1, 2017 on the original Great Memories and History of Fort Wayne, Indiana page on Facebook. Happy Jack Nelson - born March 5, 1881, shot and died May 24, 1960 when he shot a Monroeville Policeman who returned fire and killed him over his property line dispute with his neighbor in Monroeville. Read the front page newspaper article posted May 25, 2017 by Hofer and Davis, Inc. Land Surveyors on Facebook. 66, May 7, 2015, graduate of Central Catholic High School, lawyer, real estate developer and investor who was instrumental in helping Fort Wayne rebound after International Harvester ceased production here. Had a daughter, Bridget, and son, Anthony. Read more in Investor in city projects dies Helped transform Harvester plant by Frank Gray and Sherry Slater published May 19, 2015 in The Journal Gazette newspaper and his D.O. McComb and Sons obituary. Was the first female president of the American College of Cardiology, in 1983, was named one of the 100 Most Important Women in America by Ladies’ Home Journal, one of eight U.S. heart specialists selected to visit China at the invitation of the Chinese government. She was a daughter of Dr. Doster and Marie Buckner, her uncle and brother were physicians, and her mother was a nurse. The Buckner Farm is now Buckner Park a city owned park discussed in City parks get $500,000 estate gift Famed cardiologist part, of Buckner family, died July 2 by Vivian Sade published August 13, 2014 in The News-Sentinel newspaper. Famous local aerialist and vaudeville performer photos and clothing shown July 22, 2015 on The History Center Facebook page. Born in Fort Wayne, fluent in Spanish, buried at the Catholic Cemetery, 3500 Lake Ave. See Priest who focused on Hispanics dies by Rosa Salter Rodrigue published December 9, 2014 in The Journal Gazette newspaper. Refugees from Southeast Asia. Burma Soldier - Fort Wayne resident and activist Myo Myint Cho is the subject of a new HBO documentary by Michael Summerson Fort Wayne Reader. Documentary details city man's torturous past in Burma Myo Myint Cho's story spanning 30 years to air May 18 on HBO2 by Ellie Bogue published May 11, 2011 in The News-Sentinel newspaper. Discover Fort Wayne's Burmese Heritage by Lauren C. posted December 14, 2011 on Visit Fort Wayne blog. Burma, officially known as the Republic of the Union of Myanmar, is a country in Southeast Asia. The first Burmese immigrants came to Fort Wayne in the early 1990s to escape political turmoil. Since then, the Summit City has become home to approximately 5,000 Burmese, the largest group in the country. Refugee program gets official’s praise Burmese receiving community support, visit to city reveals by Brian Francisco Washington editor published June 16, 2013 in The Journal Gazette newspaper. Little Burma -getting bigger After 25 years, city cements reputation as magnet for immigrants by Ye Win Latt published April 22, 2016 in The Journal Gazette newspaper . A fictional character from Fort Wayne in the M*A*S*H film and television show played by Larry Linville. His character was born April 13th, and was married to Louise and had 3 daughters. He was president of his school stamp club and wrote for the school newspaper. See Wikipedia. Died January 6, 2015 in Evans, Georgia and was survived by his wife Sandy and sons Kelby and Ryan. In 545 games over seven seasons with the Komets, Burton scored 117 goals and 426 assists for 543 points. He ranks seventh in assists and 12th in points on the franchise's all-time career lists. Copied from Komets great Jim Burton passes away All-time defenseman, 53, dies from heart attack by Blake Sebring published January 6, 2015 in The News-Sentinel newspaper. Possibly the first woman bishop in Fort Wayne. pastor of New Zion Tabernacle Church, 1835 Spring Street. Bush served in FWCS as principal at Scott Academy except for 2003-2005, when she was principal at then-Geyer Middle School from New Fort Wayne woman bishop enjoys roles as pastor, educator by Kevin Kilbane published April 28, 2014 in The News-Sentinel newspaper. Bush, President George H. W.
Became friends with Tom Kelley, owner of several local car dealerships. Played golf many times at Sycamore Hills. TOM KELLEY SHARES MEMORIES OF GEORGE H. W. BUSH with video on WFFT.com Fox 55 television. Tom Kelley, chef recall interactions with Pres. George H. W. Bush video by Chris Darby published December 3, 2018 on WANE-TV NewsChannel 15. Fort Wayne photographer shares moments behind the lens of the 41st President Peter Turnley born and raised in Fort Wayne, a globally recognized photographer shared his experiences of capturing iconic moments of the 41st President. Published December 7, 2018 on WPTA21 ABC TV station. Born in Poughkeepsie, New York on February 12, 1947 to John and Alice Bushnell, he died September 10, 2017, age 70, of St. Joe. A Fort Wayne historian, he wrote several books including Historic Photos of Fort Wayne , Historic Photos of Indiana , Remembering Fort Wayne and Roanoke , The Renaissance of a Hoosier Village . See his Feller and Clark Funeral Home obituary. Discussed September 14, 2017 on You are positively from Fort Wayne, if you remember... Closed group on Facebook. See Scott M. Bushnell Author on Amazon.com, Author interview: Scott M. Bushnell, Hard News, Heartfelt Opinions October 01, 2007 on Indiana University Press blog and similar The Fort Wayne Gazette: From Politics to Professionalism by David Bulla published November 2008 on Jhistory on h-net.org Humanities and Social Sciences Online. Cancer claims Allen County Council President Roy Buskirk at age 72 by Jonathan Robison and Kevin Leininger published November 5, 2016 in The News-Sentinel newspaper. Steel Dynamics, Inc. Founder, born April 19, 1943 in Fort Wayne, Indiana, a North Side High School graduate, earned a degree in finance from University of Saint Francis and an MBA from IPFW. He spent 21 years with steelmaker Nucor. In 1993 he founded and eventually retired as CEO of Steel Dynamics, Inc. See Forbes.com information. The nation’s fifth-largest producer of carbon steel products. SDI operates five electric-furnace mini-mills and employs about 3,500. In 2006, its annual revenue was $3.2 billion and its annual shipments were 4.7 million tons. Busse was named Steel Man of the Year in 2004 and Steel Maker of the Year in 2006. In 2008, he was honored with the Willy Korf/Ken Iverson Steel Vision Award, which is presented to those who have made major commitments to the steel industry and promote the goodwill and integrity of the industry. From Busse donating alumni center IPFW graduate, SDI boss to build ‘lodge’ near hotel published October 14, 2009 in The Journal Gazette newspaper. Man of steel: Keith Busse and the growth of SDI in July 23, 2010 in the Greater Fort Wayne Business Weekly. Namesake for the Keith Busse School of Business and Entrepreneurial Leadership at University of Saint Francis. Was a Legendary Locals of Fort Wayne, by Randolph L. Harter, Craig S. Leonard discussion August 30, 2015 on Indiana News 1 formerly You know you've lived in Fort Wayne too long when... Facebook group. Many listeners also remember him as co-host of “Those Two Guys in the Morning” on WMEE in the 1980s. Fort Wayne morning radio fixture Charly Butcher passes away at 61 by Kayla Blakeslee published August 16, 2018 on WOWO.com. WOWO's Charly Butcher dies at age 61 published August 16, 2018 in The Journal Gazette newspaper. Photo and remembrance by Mayor Tom Henry August 16, 2018 on Facebook. The Allen County Board of Commissioners today issued the following statement upon the passing of Fort Wayne morning radio fixture Charly Butcher August 16, 2018 on Allen County Info on Facebook. See 8 minute video WOWO, WMEE colleagues honor Charly Butcher Thursday by Corinne Rose published August 16th 2018 on WKJG Fort Wayne's NBC TV station. Actor played Bob Bulldog Briscoe on the television show Frasier . November 16, 2013 visited the Rialto Theatre helping bring awareness to Reclamation Project efforts to restore the theater. See also Hollywood Star Comes Home to Direct At IPFW video by Eric Olson November 29, 2013 on Indiana NewsCenter. Born Patricia Irene on October 10, 1878, into a Catholic family of 14 children in Butler, Pa., she came to Fort Wayne in 1904 after living for a time with her sister in Montpelier, Ind. She entered nurses training at Hope (forerunner of Methodist Hospital, now Parkview Memorial), and from then on was on her own as a single, working woman. She lived at 1204 Lewis Street. She became a respected and beloved figure in the community. She also was known around the state and the country for her anti-TB work. She was such a strong local leader that the Fort Wayne league sold more TB Christmas Seals per capita than any other in the nation. When the United States entered World War I, the American Red Cross appealed for nurses to serve in military hospitals. Byron answered the call and relinquished her duties as executive secretary of the Anti-Tuberculosis League. In late September 1917, she departed for Camp McArthur outside Waco, Texas. While on active duty at the base hospital, she became ill February 13, 1918. When she grew worse, she was hospitalized and underwent surgery, but she continued to worsen and died of peritonitis on March 28, 1918. When it was learned that her body was to be shipped to California for burial, nurses, and friends here sent telegrams asking that the plan be reconsidered so the city could pay tribute to her. Nothing came of their plea and Byron was buried in Fullerton, California, where one of her sisters resided. From The Real Irene Byron, Compassionate, cheerful, dedicated to caring for others by Nancy Vendrely published March 12, 1966 in The Journal Gazette newspaper. She is remembered with the Byron Health Center. Find-A-Grave has her newspaper obituary and tombstone photo. December 24, 1915 a Fort Wayne News newspaper had an item To Remember Patients where Irene Byron was playing Santa Claus. For more read Irene Byron, A Crusader Against Tuberculosis by Peggy Seigel published April 11, 2011 on the History Center Notes & Queries blog which includes photo of Sanatorium established in 1919. See the History of the Fort Wayne-Allen County Department of Health and Wayback Machine version History of the Fort Wayne Allen County Department of Health . The Allen County Public Library has a photo of a 1920's Halloween party. There is a book Irene Byron Tuberculosis Sanatorium, Fort Wayne, Allen County, Indiana on Google Books. Two Physicians Residences location was posted to the National Register of Historic Places on December 6, 2004. Throwback Thursday! The Irene Byron Tuberculosis Sanatorium in the John Martin Smith Collection by EPLAdmin on Eckhart Public Library.